Mosby said she had enough evidence to bring the charges. Some months down the road a jury — and likely one not in Baltimore — will decide if that’s true. Mosby was criticized for referring to the demonstrators’ cries for justice. Justice is depicted as a blinded-folded woman with scales in hands, but that hardly reflects the reality of our justice system or the situation in Baltimore. Mosby had her eyes wide open. She could see the mass demonstrations over Freddie Gray, and the excuse he had become for riots, looting and arson. She campaigned on a promise of working with police to reduce violent crime but also holding police accountable. The charges she announced Friday sent a clear message to the community and the police that someone would be held accountable. According to an important article in the Sun detailing the police internal investigation, the officers there were stunned by her swift action despite unanswered questions about what happened. Freddie Gray was no model citizen. He had an array of drug-related charges on his rap sheet. He ran from police — suspicious behavior, but not a crime — and an hour later he had a severed spine and head injuries. He died a week later. His requests for medical aid went unheeded. Police believe some prisoners fake injuries, but ultimately, it seems apparent Freddie Gray died of injuries he got in police custody. Mosby says police officers killed Freddie Gray. 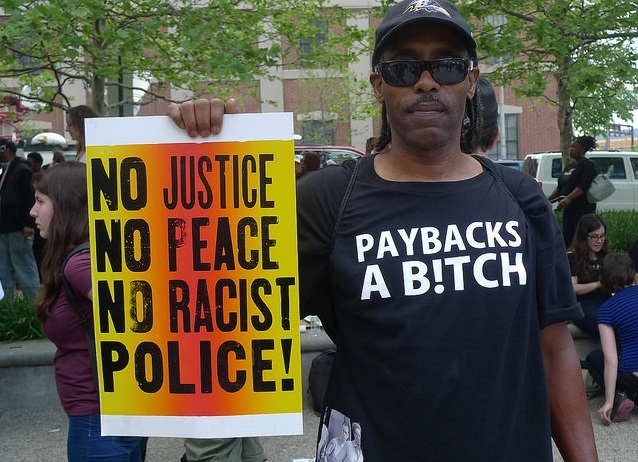 The Baltimore community believes the police killed Freddie Gray. Mosby and her staff will have to persuade at least 12 people on a jury that the police killed Freddie Gray. There will likely be several different juries to be persuaded, since the police officers will probably ask for separate trials. Proving that police killed Freddie Gray will be hard to do, defense attorneys say. But the police have been warned, and the community knows the police have been warned about aggressive policing and arrests. This warning did not deter police from arresting dozens of people over the weekend for a crime as innocent as violating a curfew and other laws during demonstrations. Marilyn Mosby, acting as a politically aware elected state’s attorney, did more to restore calm and order to Baltimore than thousands of cops and soldiers, the mayor or the governor. That calm and order was almost derailed Monday by the false report of a police shooting of a man, broadcast initially by Fox News, then spread by people who did not actually see the shooting. On video, you did see the man put in an ambulance, then later walking out of hospital. The law has given prosecutors and police immense discretion to act on crimes or not, to arrest or not to arrest, to charge or not to charge. Mosby may have ruined the careers of six cops who may or may not be guilty of a crime. But she certainly restored the peace of Baltimore this weekend, and perhaps moved the city and its police force toward a better and more balanced relationship.